Painting for Preservation's last Art-In at the ruins of St. Mary’s on the Hill is an only too real example of an abandoned neighborhood landmark left to rot. Vacancy and perceived uselessness is the greatest cause of deterioration at a historic building. Maintenance is deferred, moisture infiltrates, pipes burst, and slowly the inside and the outside of the building peel apart. 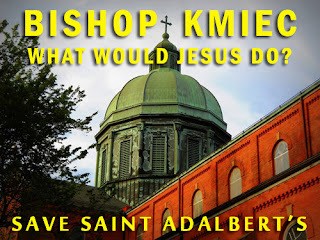 The forced stifling of activity at Saint Adalbert’s Basilica by the Bishop of Buffalo Most Rev. Edward U. Kmiec may eventually lead the massive church to a similar end - but not with the consent of this very active East Side parish that has remained open four years longer than expected. 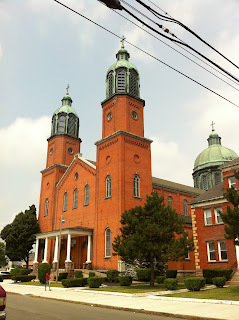 Saint Adalbert Basilica parish was founded in 1886 as the second Polish parish in the city of Buffalo. In 1890 to1891, Huber and Company designed and built the Romanesque church standing today. At the time it was built, it was the largest church in Western New York and remains one of the largest. The Basilica features a massive main altar of Italian marble with seven independently carved statues elevating a golden crown. Of curiosity, a likeness of the Black Madonna enshrined at one of the side altars had the distinction of appearing in the 1901 Pan American Exhibition. In 1907, Pope Pius X authenticated a document spiritually marrying St. Adalbert to St. Peter’s Basilica in Rome, a distinction allowing the East Side Basilica to perform higher rites and host the Pope, if ever called to do so. The parishioners of St. Adalbert’s and their many out-of-town supports are determined to defer the closing of the Church, again and again, since 2007 when Bishop Kmiec called for merging Saint Adalbert Basilica with Saint John Kanty, closing St. Adalbert permanently. Unlike some church closures, St. Adalbert is financially stable and has an active parish. On a Sunday in July, I stopped by and found generations of families conversing over the pews, children playing in the stained glass rainbows and church leaders of determination and innovation. Most recently, active parishioners launched their own “What Would Jesus Do?" Campaign meant to cause reflection and hopefully, a reprieve by Bishop Kmiec. The parishioner’s passion to keep their church open was recognized by the Vatican and the church is in possession of a letter stating that that Saint Adalbert Basilica must remain open as a place of worship accessible to the faithful. A holy declaration that the Bishop is denying. Painting for Preservation will set up on Sunday, September 11, 2011 at St. Adalbert Basilica at 212 Stanislaus Street beginning at 9:30am and disbanding around 1pm. Artists, photographers, community members, East Side advocates and parishioners are welcome to participate and observe. The art work created at this Art-In will be on display at the celebration of St. Adalbert’s 125th Anniversary on Sunday, September 18, 2011 at Millennium Banquet Hall in Cheektowaga. * Thank you to Charlie Penasak and Lori DiNero for their writing this post and their enthusiastic participation in Painting for Preservation. God Speed, Saint Adalbert Basilica Parish!